Palestinian hunger striker Samer Issawi has appeared in an Israeli court, where his lawyers attempted to get him released on bail, as hundreds protest across the West Bank. Gaunt and wheelchair-bound, Issawi appeared on Tuesday before a Jerusalem civil court, which deferred releasing him for at least another month. “This is the third time [Issawi] has appeared in court to try to get out on bail, the previous two times were rejected,” Al Jazeera’s Nicole Johnston reported from Jerusalem. Issawi has been refusing food for more than 200 days, in protest of Israel’s policy of ‘administrative detention,’ which allows authorities to detain Palestinians without charge or trial indefinitely. His rapidly deteriorating health, caused by his recent refusal of water and vitamins, has brought international attention to his case and put Israel’s detention policies under the spotlight. The worsening health of Issawi and other prisoners on hunger strike in Israeli jails has led to several mass protests across the occupied Palestinian territories, some of which resulted in clashes with the Israeli army. Activists report that hundreds of Palestinians began a protest at the International Committee of the Red Cross in Ramallah and then moved to Israel’s Ofer prison, in the West Bank. Palestinian medical sources told Al Jazeera that at least 10 Palestinians were wounded by rubber-coated steel bullets fired by Israeli soldiers – two in their heads. Another protester was shot in the leg with live ammunition and ten are being treated for tear gas suffocation. Amani Srahna of the Palestinian Prisoners Club says 800 inmates in three prisons are participating in Tuesday’s one-day hunger strike in solidarity on Tuesday. On Monday, more than 1,000 people rallied in the northern city of Nablus and another 1,500 gathered in the center of the southern city of Hebronto demand their release. Dozens of Palestinian youths also blocked the entrance to the UN offices in Ramallah, but Palestinian police prevented them from entering the building. With public anger growing over the fate of the prisoners, Palestinian negotiator Saeb Erakat wrote to EU foreign policy chief Catherin Ashton urging action to improve treatment of prisoners and secure their release. “We believe it is no longer acceptable to merely request better treatment of Palestinians in Israeli occupation prisons, but to demand an end to the arbitrary system of Israeli detentions,” Erakat said in the letter. Flagging the deteriorating health of the four prisoners on hunger strike – Samer Issawi, Tareq Qaadan, Jafar Ezzedine and Ayman Sharawna – Erakat said the Palestinians would hold Israel “fully responsible” if one of them died. Meanwhile, in occupied east Jerusalem, Israeli police staged an overnight raid on Issawi’s family home, arresting his brother Shaadi, the family and police said. Police confirmed the arrest, but refused to give further details. Issawi, 33, and Sharawna, 36, were long-term prisoners who were released in October 2011 under the prisoner swap deal where more than 1,000 Palestinians were released in exchange for captured Israeli soldier Gilad Shalit. But within months, they were both re-arrested following unspecified allegations that they violated the terms of the agreement, with Israel ordering them to serve out the remainder of their original sentences. 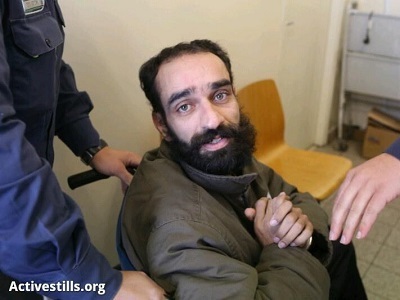 “Issawi is one of more than 10 prisoners rearrested after the prisoner exchange deal,” Johnston reported. His family denies that he left the municipality of Jerusalem. “This is a very controversial issue for Palestinians, they thought the prisoner exchange deal was guaranteed by Egypt, but now they see that an Israeli military law came into effect around the same time which allows Israel to rearrest these prisoners and… serve out the remainder of their original sentences,” Johnston said. Statistics published by Israeli rights group B’Tselem show that at the end of 2012, 4,500 Palestinians were being held in Israeli jails.